It's a clever and catchy name, with a logo to match. On December 18, Air Canada unveiled its new leisure airline -- Air Canada rouge. It's Canada's flag carrier's first foray into the growing leisure travel sector, and begins operations on July 1, 2013. The name Air Canada rouge was selected through a Facebook contest where customers, employees and travel industry professionals were asked for their input. 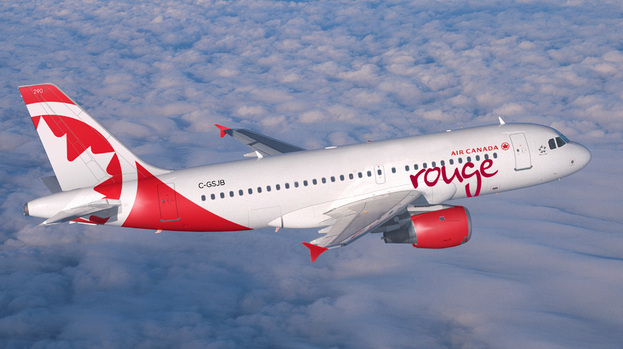 For its inaugural 2013 season, Air Canada rouge will offer new routes not currently being operated by Air Canada to Venice, Italy and Edinburgh, Scotland. Seasonal service from Toronto and Montreal to Athens, Greece will also be offered by the carrier. Existing Air Canada flights operated via Air Canada Vacations to Cuba, the Dominican Republic, Jamaica and Costa Rica will be operated by Air Canada rouge effective July 2013. Costa Rica (San Jose and Liberia): Starting at $389 one-way. Air Canada Vacations is also offering introductory specials for bookings made by December 25 on air-inclusive packages to select Caribbean and European destinations. Air Canada rouge flights will depart Air Canada's main hub at Toronto's Pearson International Airport, offering connections with Air Canada, Air Canada Express and its Star Alliance partner flights. It will also operate non-stop flights from Montreal's Trudeau Airport to Athens, in addition to its Toronto-Athens flights. Air Canada rouge offers through-fares from any point within Air Canada's network on a single ticket, as well as baggage checked through to final destination and Aeroplan points. The Air Canada rouge fleet will initially be made up of two Boeing 767-300ER aircraft for transatlantic flights in a two-cabin configuration and two Airbus A319 aircraft for North American flights in an all-economy configuration. Eventually, Air Canada rouge may operate up to 20 Boeing and 30 Airbus aircraft, for a total of 50. This will be possible when Air Canada begins to take delivery of its new Boeing 787 Dreamliner aircraft in 2014.